What says fall more than cooking kielbasa over the fire enjoying live music in the crisp evening autumn air? 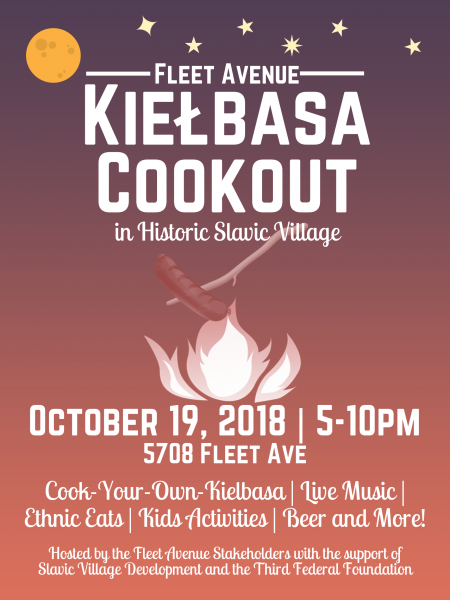 The second annual Fleet Avenue Kielbasa Cookout in Slavic Village! Bring the family to cook your own Polish, Slovenian or Hungarian kielbasa over the fire while listening to a range of live music- from Rock n’ Roll to R&B to Polka- featuring Slavic Village bands. Taste delicious Slavic cuisine (and beer!) from local restaurants and learn traditional Polish cooking techniques at the food demo booth. Plus, bring the kids to cook s’mores, make art and more! Hosted by the FLEET AVENUE STAKEHOLDERS with support from Slavic Village Development and the Third Federal Foundation.